We have numerous technologies that can help keep a close watch on an individual's glycaemic status and thereby assist in developing successful diabetes management strategies. For more than five decades, self-monitoring of blood glucose (SMBG) has remained as the gold standard tool to manage glycaemic status and has gained huge acceptance. Rigorous research further led to the development of more and more advanced technologies such as continuous glucose monitoring and flash glucose monitoring. These novel technologies are more promising in terms of revealing the complete glycaemic picture and even more user-friendly than the already established blood glucosemetres. However, they are yet to achieve remarkable accuracy and performance. There will also be a subgroup of patients who will be using these technologies only occasionally and thus will definitely require SMBG at other times. Again, with regard to the retrospective ones, glucose data can be obtained only once they are downloaded to the system and hence, real-time values will still have to be procured with the help of an SMBG. In future when the accuracy and performance of these newer technologies become equal to that of glucometres, the glucometres might vanish. Until then, all these technologies will definitely go hand-in-hand and supplement each other than competing each other. All the related literature were retrieved from various databases including 'PubMed' and 'Cochrane Database of Systematic Reviews' using specific search terms that were relevant to the topics discussed this manuscript. Several methods for glucose monitoring, each with differing utility and limitations have been available to assess blood glucose levels and for timely management of glycaemic fluctuations. Even though, glycated haemoglobin (HbA1c) is highly accepted for assessing the risk of complications and as a prognosis indicator for the success of treatment of diabetes, it does not capture the 'real-time' information about individual glycaemic excursions. Therefore relying entirely on HbA1c to get a complete picture of glycaemic control is not recommended and frequent monitoring of blood glucose levels to reveal underlying glycaemic variability, should be performed to complement HbA1c. Nowadays, glucose monitoring technologies with varying features and capacities find widespread use in hospitals, outpatient departments, emergency rooms, ambulatory medical care and home self-monitoring, thereby enabling prospective diabetes management. In this review, we have tried to weigh the benefits and shortcomings of currently popular glucose monitoring technologies and tried to assess whether any of them might completely replace the rest in the near future. All the related literature were retrieved using specific search terms such as 'diabetes', 'glucose monitoring', 'SMBG', 'CGM', 'FGM', 'self-monitoring of blood glucose', 'continuous glucose monitoring', 'flash glucose monitoring', 'ambulatory glucose profile', 'AGP', 'comparison of glucose monitoring technologies', 'advantages of glucose monitoring technologies' and 'disadvantages of glucose monitoring technologies'. Searches were performed in various databases including 'PubMed' and 'Cochrane Database of Systematic Reviews'. All the relevant data were retrieved from these articles and utilised for preparing this review manuscript. The history of glucose monitoring can be traced to mediaeval times and efforts were made to identify various diseases by assessing urine samples. Copper reagent for urine sugar developed by Stanley Benedict in 1908, with several modifications remained the mainstay of urine monitoring of diabetes for more than a century. However, urine tests are unsatisfactory and cannot be used to monitor strict control since they often do not reflect prevailing blood glucose concentrations accurately (urine gets collected in the urinary bladder over a period of several hours and hence does not reflect the glucose levels at the time of testing). In addition, the test gives no information on blood glucose fluctuations below the level of the renal threshold. This is because glucose appears in the urine only when the blood glucose level is above 10 mmol/L and thus, a negative urine glucose test may be obtained either due to normoglycaemia or due to a fatal hypoglycaemic event, making it difficult to differentiate between the two conditions. Research from Miles-Ames Laboratory became the key element in the history of blood glucosemetres. The quest for a more convenient and specific method led to the development of a 'dip and read' urine reagent strip, Clinistix, in 1957. Later on, Ames research team led by Ernie Adams in 1965 developed the first blood glucose test strip, the Dextrostix, a paper reagent strip. Around the same time, the German company Boehringer Mannheim developed a competitive blood glucose strip, the Chemstrip bG. Limitations associated with these strips further triggered researchers to develop an automatic, electronic glucose test strip reader with improved precision and to yield more quantitative blood glucose results. In the late 1960s, Ames Reflectance Meter (ARM) [Figure 1] developed by Anton H. Clemens produced quantitative blood glucose results with Dextrostix and was commercially available in 1970. The first reported patient to use blood glucosemetre for his use was Richard Bernstein, who suffered from severe complications of type 1 diabetes mellitus (T1DM). In 1969, he was fortunate enough to procure a glucometre for personal use, through his wife a physician. After endless trials and errors, he could demonstrate that with self-monitoring of blood glucose (SMBG) and subsequent adjustments made in insulin doses, diet and frequency of testing, glucose levels could be normalised and diabetes-associated complications could be minimised. Although he highly accomplished to manage his own disease, as one without medical credentials, he faced difficulties in gaining the necessary attention of the medical community towards his findings. He tried to publish his ideas, but no journal accepted it. Even his physician who was the past president of the American Diabetes Association (ADA) was not convinced. To realise his mission, he left his original profession as an engineer and set out to earn a medical degree. He succeeded in publishing his results and in the early 1980s, ADA changed its position and started to recommend patients for SMBG. Currently, 83 years of age, Bernstein has outlived the life expectancy of a T1DM and his techniques are highly regarded amongst his patients to achieve glycaemic control and to reduce the associated complications. Marked evolution in the field during the 1980s led to the development of easier to use, smaller glucometres with built-in memory that could store and retrieve the results. Reagent strips were equipped to accept smaller volumes of blood and some were barcoded to achieve auto calibration and quality assurance. A biosensor is a compact analytical device or unit that incorporates a biological or biologically derived sensitive recognition element integrated or associated with a physiochemical transducer. Clarke and Lyons were the first to describe a glucose biosensor and in 1975 the first commercially successful glucose biosensor using Clark's technology (Yellow Springs Instrument Company analyzer Model 23A YSI analyzer that worked on the principle of amperometric detection of hydrogen peroxide) for the direct measurement of glucose was introduced. The first electrochemical blood glucose monitor for self-monitoring, ExacTech from MediSense Inc., was launched in 1987. It was a pen-sized device and employed glucose dehydrogenase-pyrrole-quinoline quinone enzymes and a ferrocene derivative. Many of the currently available glucose biosensors very much resemble ExacTech meter and various self-monitoring glucose biosensors work on the principle of ferrocene or ferricyanide mediators. Increased daily frequency of SMBG was significantly associated with lower HbA1c and with fewer acute complications in T1DM children and adolescents. Home blood glucose monitoring is also recommended for T2DM patients to gather information on their glycaemic excursions. To a limited extent, it also helps the patient to adjust the diet and exercise pattern in the day-to-day life. SMBG data also help the physician to individualise the treatment targets as well as empowers the patient to be more conscious towards his diabetes management. Invention of third-generation glucose biosensors has further paved way to tremendous developments in glucose sensing technology. They are unique from the earlier generation biosensors in the sense that they are reagent-less and are based on direct transfer between the enzyme and the electrode without mediators. This enabled the development of implantable, needle-type devices for continuous in vivo monitoring of blood glucose. Evolution of continuous glucose monitoring (CGM) devices can be traced back to the mid-1970s followed by the development of sensor technology and implantable glucose sensors in early 1980s. However, this technology was not commercially available until the original MiniMed Continuous Glucose Monitoring System (CGMS), CGMS Gold (Medtronic MiniMed, CA, USA) got FDA approval in 1999. Several CGMs, are currently available [Figure 2], that can provide either retrospective or real-time information on glycaemic status. Ambulatory glucose profile (AGP) is a modal graph where 14 days of glucose data are collated to form a graph as if they occurred in a single 24-h period. The collated data also helps to predict the glucose pattern for the next 30 days, enabling us to visualise glycaemic patterns. The history of AGP dates back to 1987, where Mazze et al. used reflectance meters containing memory chips to store 440 individual blood glucose values with corresponding time and date. These data were organised into 14 day periods and collapsed into a graphical depiction which came to be known as AGP. Thus, AGP was a novel step which systematically presented SMBG data and reflected features beyond glycaemic control including amplitude and frequency of changes in the glycaemic level. However, this technology was wrought by several limitations including that AGP being a daytime profile and not a continuous monitoring system. It did not consider variables including diet, exercise, the timing of medications, etc. Moreover, frequent and sustained SMBG was required for the construction of AGP. Interest on AGP rekindled when an expert panel of diabetes specialists met in Florida, to discuss the utility of CGM in clinical practice and research applications where they were introduced to the universal software report, the AGP, created by Mazze et al., and further developed by the International Diabetes Center, Minneapolis, MN. The panel observed that standardising glucose reporting and analysis, with tools such as AGP, maybe one step towards optimising clinical decision making in diabetes. Will Novel Glucose Monitoring Systems Replace Self-Monitoring of Blood Glucose? With the benefits of SMBG in the prevention of long-term complications of diabetes, this procedure should be recommended by health-care professionals in all patients with diabetes irrespective of the medications. However, the beneficial effects can be perceived only by those individuals in whom therapeutic and lifestyle changes are incorporated based on monitored parameters. For such changes to be made, either the patient should be highly educated and motivated or should receive directions from experts at frequent intervals. Another major drawback of SMBG is its ineffectiveness in detecting asymptomatic hypoglycaemia or nocturnal hypoglycaemia, especially in the presence of near-normal HbA1c values. Since it provides information only about the blood glucose at a particular point, significant glycaemic excursions may often go unnoticed. In contrast, CGM and FGM systems share many remarkable features, and more importantly, can effectively reveal glycaemic trends. The glucose data procured by these systems serve as a valuable learning tool, showing patients the immediate impact of lifestyle and medicinal decisions. In real-time versions, responding in a timely manner to high and low glucose alerts can reduce glucose variability. However, more randomised controlled trials are required to prove the superiority of CGM and FGM over SMBG. Furthermore, there is a sub-group of patients (especially T2DM patients) who will not be using these novel technologies continuously and thus will definitely have to perform SMBG at other times. With regard to the retrospective ones, the glucose data can be procured only once they are downloaded to the system and hence, real-time values will still have to be obtained by performing SMBG. Similarly, though these technologies provide huge data, to reap the real advantage of it, these data need to be analysed and interpreted which requires a lot of time and commitment both from the side of the patients and that of the physicians involving multiple members from either side. This is not practically possible in all the settings. On the contrary, glucometers are easy to use. A major limitation of glucometers, i.e., pain of pricking the finger, which is still a concern for around 60% of the patients, is going to go away with new innovations that avoid the pain of pricking the finger. Some evidence is available that support the use of CGM over SMBG in the T1DM paediatric population. However, many failed to show the effectiveness of CGM in reducing HbA1c in this group. Few studies have proven the effectiveness of CGM in type 2 diabetes patients over SMBG. The lag time associated with CGM, its short sensor wear time (3-7 days) and need for frequent finger-prick calibration stands as major limitations of this technology. Even though a CGM produces far more information than a normal SMBG, it measures glucose in ISF and not blood. Therefore a discrepancy should be expected between the values obtained from CGM and SMBG, more particularly at the times when glucose fluctuations are prominent such as during a meal or exercise. Considering this fact, the decision of administering insulin or correcting hypoglycaemia should be done only based on SMBG and not on the values from CGM. Frequent calibration of the CGM system should be performed on the basis of SMBG readings (1–3 times a day) which is another reason why CGMs cannot completely replace SMBG. Similarly, even with improved performance standards, the accuracy and reliability of CGM systems might get compromised during exogenous pharmacologic interferences. In one of the studies by Ananda et al., the CGM detected glucose values were found to vary due to interference from acetaminophen whereas plasma glucose concentrations remained unaltered. Benefits of wearing a CGM sensor seem to vary according to the duration and frequency of its use. STAR 3 study revealed that when CGM was worn 60% of the time, HbA1c was lowered by 0.5% in contrast to 1.2% drop achievable when it was worn 80%–100% of the time. The 'hassle factor' associated with CGM such as the need for frequent needle insertions, sensor and transmitter (or recorder) to be worn throughout, getting exhausted from responding to cautionary, redundant, or outright false alarms, etc. all poses inconveniences, physical discomforts, and psychological burdens to the users. Cost is another major prohibiting factor towards the use of CGM or FGM. The majority of the health plans, insurance companies and governments in most countries throughout the world do not cover for these technologies. In many of the instances, depending on the patient's interest and their financial resources, some patients might opt for these technologies only briefly or intermittently as a diagnostic, educational and/or motivational tool, rather than a core aspect of daily diabetes management. 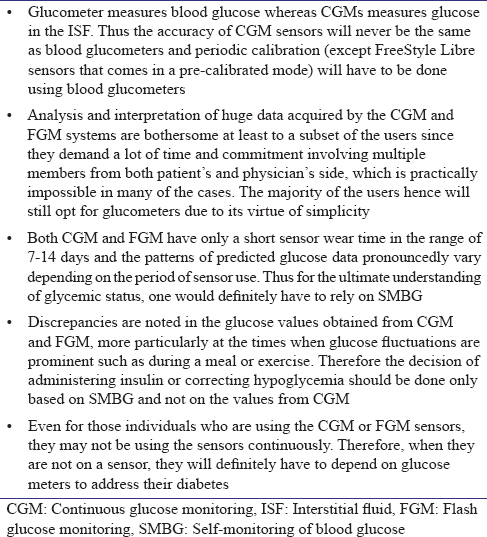 Some of the limitations of CGM such as short sensor lifetime, need for finger-prick calibration, etc. has been resolved to a considerable extent by Abbott's FreeStyle Libre FGM. However, the manufacturer itself in the product description has indicated a caution that the device may at times inaccurately indicate hypoglycaemia  and thus necessitates SMBG whenever such a scenario arises. A general comparison of the benefits and shortcomings of SMBG, CGM and FGM are provided in [Table 1]. Numerous options for glucose monitoring available as of today have their own advantages and disadvantages. The ultimate goal of any approach should be to achieve adequate glycaemic control by avoiding hypoglycaemia and with utilisation of available resources of monitoring. With current evidence, both CGM and FGM systems may be used as a technology only to supplement the use of SMBG in the management of diabetes. Newer technologies might replace the old ones, but this is not likely to happen at least for the next 10 years. Some of the drawbacks/limitations of novel CGMs that could be pointed out to argue that they will not likely replace SMBG in near future are listed in [Table 2]. SMBG remains the gold standard of blood glucose monitoring and its usefulness to ward off diabetes complications is very well-accepted. Newer devices such as CGM and FGM systems have further improved the prospects of glucose monitoring and provide more insights into the trends and patterns of glycaemic variations. However, in the current scenario, these novel technologies may not completely overshadow SMBG. The associated costs, the discrepancy with the blood glucometer values especially during pronounced glycaemic excursions, shorter sensor wear-time, etc. still poses as the shortcomings of these devices. Technologies are going to be complementary, with the SMBG, CGM and FGM technologies complementing each other, especially in the current era of a patient-centred approach where the physicians need to choose which all tests need to be employed either alone or in combination for a successful diabetes management. Patients will use CGM along with insulin pumps and Artificial Pancreas, many others will employ FGM sensors for real-time or retrospective glucose monitoring. Whatever be the purpose, there is the need for a strong and committed team of physicians, dieticians and others who can help patients with changing therapies and behaviours. Therefore, none of these patients will probably be using these glucose sensors all the time and majority of the time they will be using glucometres. Guidelines will probably emerge regarding the recommended frequency of use of each of these technologies. Glucometers are already proven cost effective. Similarly, it needs to be proven that these newer devices are extremely accurate as well as cost effective in terms of preventing the cost of complications in diabetes. To address the inconvenience of painful finger pricks associated with SMBG, patient education regarding less painful techniques. alternative testing sites such as the forearm may be promoted. Whatever be the mode of glycaemic monitoring, beneficial effects of these technologies can only be perceived, if the individuals are compliant to diabetes care and are ready to bring in therapeutic and lifestyle changes based on the procured data. Hirsch IB, Brownlee M. Should minimal blood glucose variability become the gold standard of glycemic control? J Diabetes Complications 2005;19:178-81. Benedict SR. A reagent for the detection of reducing sugars. J Biol Chem 1909;5:485-7. Tattersall RB. Home blood glucose monitoring. Diabetologia 1979;16:71-4. Free AH, Adams EC, Kercher ML, Free HM, Cook MH. Simple specific test for urine glucose. Clin Chem 1957;3:163-8. Free AH, Free HM. Self testing, an emerging component of clinical chemistry. Clin Chem 1984;30:829-38. Cheeley RD, Joyce SM. A clinical comparison of the performance of four blood glucose reagent strips. Am J Emerg Med 1990;8:11-5. Mendosa D. History of Blood Glucose Meters; Transcripts of the Interviews 2001; 2006. Available from: http://www.mendosa.com/history.htm. [Last accessed 2005 Apr 16]. Bernstein RK. Dr. Bernstein's Diabetes Solution: The Complete Guide to Achieving Normal Blood Sugars. Hachette UK; 2011. 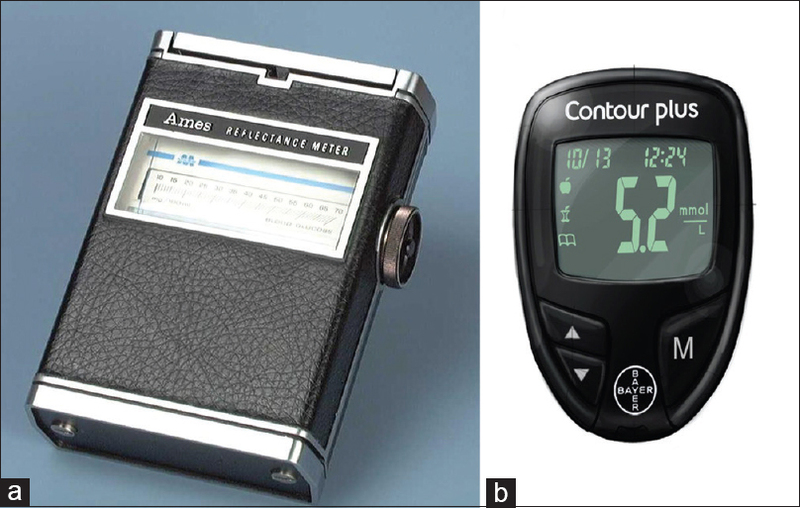 Clarke SF, Foster JR. A history of blood glucose meters and their role in self-monitoring of diabetes mellitus. Br J Biomed Sci 2012;69:83-93. Yoo EH, Lee SY. Glucose biosensors: An overview of use in clinical practice. Sensors (Basel) 2010;10:4558-76. Ziegler R, Heidtmann B, Hilgard D, Hofer S, Rosenbauer J, Holl R, et al. Frequency of SMBG correlates with HbA1c and acute complications in children and adolescents with type 1 diabetes. Pediatr Diabetes 2011;12:11-7. Kesavadev J, Shankar A, Pillai PB, Krishnan G, Jothydev S. Cost-effective use of telemedicine and self-monitoring of blood glucose via diabetes tele management system (DTMS) to achieve target glycosylated hemoglobin values without serious symptomatic hypoglycemia in 1,000 subjects with type 2 diabetes mellitus – A retrospective study. Diabetes Technol Ther 2012;14:772-6. Cengiz E, Sherr JL, Weinzimer SA, Tamborlane WV. New-generation diabetes management: Glucose sensor-augmented insulin pump therapy. Expert Rev Med Devices 2011;8:449-58. Zisser H, Lane JE, Shivers JP. Continuous Glucose Monitoring: Professional and Real Time. In: Bruttomesso D, Grassi G, editors. Technological Advances in the Treatment of Type 1 Diabetes. Front Diabetes. Vol. 24. Basel: Karger; 2015. p. 81-98. Diabetes Research in Children Network (DirecNet) Study Group, Buckingham B, Beck RW, Tamborlane WV, Xing D, Kollman C, et al. 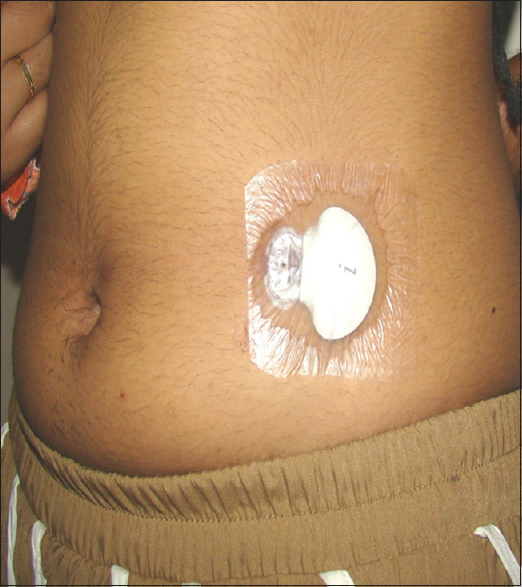 Continuous glucose monitoring in children with type 1 diabetes. J Pediatr 2007;151:388-93, 393.e1-2. Schwartz S, Scheiner G. The role of continuous glucose monitoring in the management of type-1 and type-2 diabetes. Evidence Based Management of Diabetes. United Kingdom: TFM Publishing Limited; 2012. Cengiz E, Tamborlane WV. A tale of two compartments: Interstitial versus blood glucose monitoring. Diabetes Technol Ther 2009;11 Suppl 1:S11-6. Wolpert H. Establishing a continuous glucose monitoring program. J Diabetes Sci Technol 2008;2:307-10. Mazze RS, Lucido D, Langer O, Hartmann K, Rodbard D. Ambulatory glucose profile: Representation of verified self-monitored blood glucose data. Diabetes Care 1987;10:111-7. Mazze RS, Strock E, Wesley D, Borgman S, Morgan B, Bergenstal R, et al. Characterizing glucose exposure for individuals with normal glucose tolerance using continuous glucose monitoring and ambulatory glucose profile analysis. Diabetes Technol Ther 2008;10:149-59. Distiller LA, Cranston I, Mazze R. First clinical experience with retrospective flash glucose monitoring (FGM) analysis in South Africa: Characterizing glycemic control with ambulatory glucose profile. J Diabetes Sci Technol 2016;10:1294-302. Bergenstal RM, Ahmann AJ, Bailey T, Beck RW, Bissen J, Buckingham B, et al. Recommendations for standardizing glucose reporting and analysis to optimize clinical decision making in diabetes: The ambulatory glucose profile (AGP). Diabetes Technol Ther 2013;15:198-211. Chaithanya MK, Ramya B, Vidya E, Anjana RM, Mohan V. Usefulness of Ambulatory Glucose Profile (AGP) in diabetes care. In: Muruganathan A, Bansode BR, editors. Progress in Medicine 2017 (Medicine Update 2017). The Indian College of Physicians and The Association of Physicians of India; 2017. p. 220-5. Ji L, Guo X, Guo L, Ren Q, Yu N, Zhang J, et al. A multicenter evaluation of the performance and usability of a novel glucose monitoring system in chinese adults with diabetes. J Diabetes Sci Technol 2017;11:290-5. Kesavadev J, Krishnan G, Saboo B, Shankar A, Ashok AD, Sanal G, et al. Better outcomes in type 2 diabetes management with a user friendly flash glucose monitoring system: FreeStyle Libre Pro, in Abstracts from ATTD 2017 10th International Conference on Advanced Technologies & Treatments for Diabetes Paris, France. 15-18 February, 2017. Diabetes Technol Ther 2017;19:A1-133. Weber KK, Lohmann T, Busch K, Donati-Hirsch I, Riel R. High frequency of unrecognized hypoglycaemias in patients with type 2 diabetes is discovered by continuous glucose monitoring. Exp Clin Endocrinol Diabetes 2007;115:491-4. Golicki DT, Golicka D, Groele L, Pankowska E. Continuous glucose monitoring system in children with type 1 diabetes mellitus: A systematic review and meta-analysis. Diabetologia 2008;51:233-40. Gandhi GY, Kovalaske M, Kudva Y, Walsh K, Elamin MB, Beers M, et al. Efficacy of continuous glucose monitoring in improving glycemic control and reducing hypoglycemia: A systematic review and meta-analysis of randomized trials. J Diabetes Sci Technol 2011;5:952-65. Davey RJ, Low C, Jones TW, Fournier PA. Contribution of an intrinsic lag of continuous glucose monitoring systems to differences in measured and actual glucose concentrations changing at variable rates in vitro. J Diabetes Sci Technol 2010;4:1393-9. Basu A, Veettil S, Dyer R, Peyser T, Basu R. Direct evidence of acetaminophen interference with subcutaneous glucose sensing in humans: A Pilot study. Diabetes Technol Ther 2016;18 Suppl 2:S243-7. Kaufman FR. Insulin Pumps and Continuous Glucose Monitoring: A User's Guide to Effective Diabetes Management. The United States of America: American Diabetes Association; 2012. Rodbard D. Continuous glucose monitoring: A Review of successes, challenges, and opportunities. Diabetes Technol Ther 2016;18 Suppl 2:S3-S13. Indications and Important Safety Information. Available from: http://www.freestylelibrepro.us/safety-information.html. [Last accessed on 2017 Feb 27]. Khadilkar KS, Bandgar T, Shivane V, Lila A, Shah N. Current concepts in blood glucose monitoring. Indian J Endocrinol Metab 2013;17:S643-9. So CF, Choi KS, Wong TK, Chung JW. 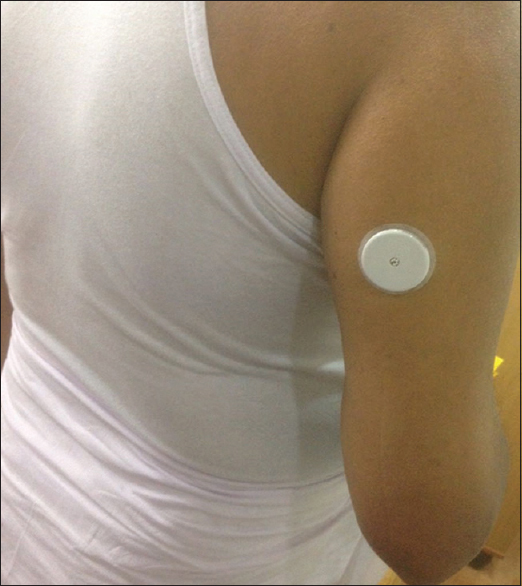 Recent advances in noninvasive glucose monitoring. Med Devices (Auckl) 2012;5:45-52. Chaplin S. Non-invasive blood glucose testing: The horizon. Pract Diabetes 2016;33:313. Renard E. Monitoring glycemic control: The importance of self-monitoring of blood glucose. Am J Med 2005;118:12S-9S.